Essentially when it comes to hardwood flooring it's better to have it installed by a professional. Laminate Flooring can be installed if you would like to do it yourself, whereas hardwood flooring installation tends to need a little more finesse so to speak. Nonetheless, if this is something you want to do on your own to save some money or you have experience in laying down flooring, this might be an alternative option, but you do need good instructions to get hardwood flooring all right in just about any room you choose. Thankfully, the article below contains an in-depth guide from start to finish and a list of both tools and material you will need to install hardwood floors. Also included are pictures since visuals are always a plus when doing any project. The very first thing you need to do is pick out your boards – the species, the widths, and the type of boards. This should be done before any installation steps are taken. You need to measure both the width and the length of the room and then multiply these numbers to come up with a square footage. When it comes time to actually ordering your floor, make sure that you get an extra 15% so that if you make any cutting mistakes you will have extra. It's sort of just a precaution. Next, you need to check your subfloor and make sure there are no noises or screeches. The minimum requirement for a hardwood floor is 3/4” of a subfloor. If you find any screeches in the flooring, simply use a longer drywall screw and then screw it into the sub floors joint where the noise is at. Next, remove any shoe molding from the room – sweep and clean afterward. The paper should be rolled out accordingly, with a 4-inch overlap for each piece. Make sure you use your staple gun to secure the paper to the flooring. Next, take your pencil and make a mark along the baseboards where the joists are located on the flooring. Start with the wall in the room that is the longest most unobstructed wall. Remove your shoe molding and take your chalk line and snap it 3/8” out fro the actual baseboard. This is what any professional would do when they install your flooring – that small space allows for expansion in the hot weather and contraction in colder weather. Choose a longer board, that is also straight, and use that one to start the first row of the boards. 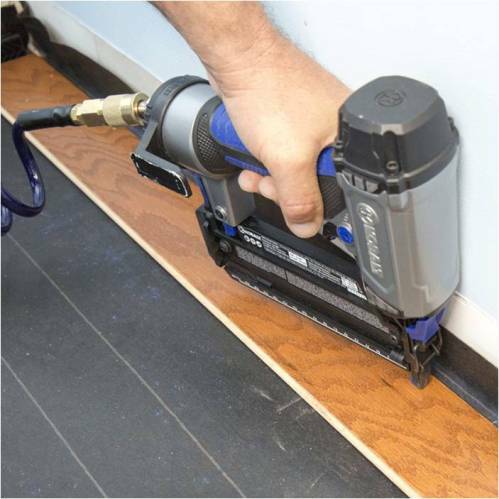 Use your chalk line as a sort of guideline to place the board edge on and then use a drill to drill down pilot holes through the wood and into the subfloor of the flooring. You also need to face nail every plank at every joist and then you need to set the nail using your nail set. The whole point to this is to face-nail the entire first row and keep the board lengths random. When you face-nail the first row you do so because the pneumatic nails are not allowed to get inside of the area – if the nail does, you lose that 3/8” you created and would, in turn, lose your expansion and contraction. Once a few rows have been installed, you need to use your drill to pilot holes down into each tongue of the boards. Then, hand-roll each nail until you have enough clearance for the pneumatic nail gun. Tip: It's always a good idea to lay your planks out for 48 hours before you install them to let them get acclimated to the room. But, it's also a good idea to lay the boards out ahead of installation so you can visually see the different lengths, shapes and of course the grain of each plank. Keep each of the lengths random and at least 6 inches in length. Using the gun, place it over each lip of the edge of the plank and strike the gun firmly with your mallet – this will drive the staples into the tongue of the plank. Remember, at this moment, it's not exactly critical to make sure that all of the threshold planks are exact cuts. You can go over them once everything is installed and then use a saw to cut across for your precision cuts. The gun itself can be pretty expensive to buy, so it's a good idea to look at a few home improvement places and see if you can rent one. You want to measure that all of your planks are fit together – a tongue end and a groove end should be matched, these are called an “end matched.” The rule of thumb is to have a nail every 10 to 12 inches. Next, after all, the boards have been laid, you need to fill in all of your nail holes that have been face-nailed. Make sure that you find a wood putty that actually matches with your floor color, otherwise… what's the point of all this hard work! Fill each hole and then use a clean rag to remove any access. After doing all of this hard work you can enjoy your floor for what it is. However, you should also be maintaining it as often as possible. 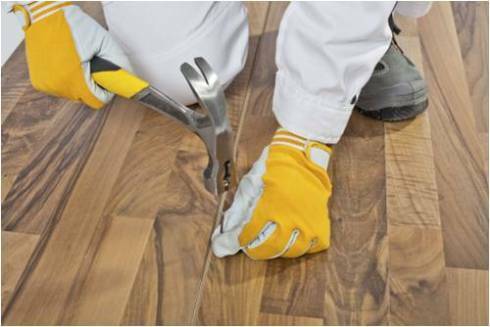 When a hardwood floor is pre-finished, you need to make sure that you keep grit, dirt, dust and sand off of it. If not, this can result in scratches or worse. Make sure that you sweep and vacuum the wood flooring at least a few times a week. 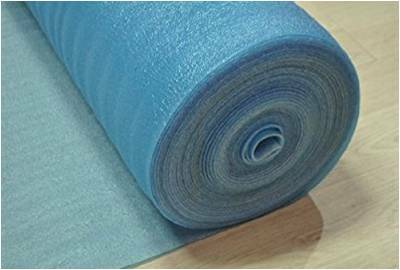 You can also use a floor cleaning kit that is specifically for hardwood floors to clean up any other debris like mud that you can't sweep up and then use a soft and clean microfiber cloth to wipe it all up. If you do use a vacuum make sure that they have a feature where the lip of the vacuum cleaner can be raised upwards, otherwise you could scratch your flooring. Instead of an upright vacuum, you could think about a handheld vacuum cleaner instead – you have more control over how the floor is touched, and most handheld cleaners come with a soft brush so as to not scratch the wood. If you installed your flooring correctly and you take care of it properly, you should have absolutely no problem keeping your wood flooring looking and feeling good for the entire time you live in the home. Some people take wood floors for granted, but knowing that you put the floor in yourself, should give you some pride and might make you work a little harder to keep it clean and healthy.